Backgammon Games Terms, part 2 includes the unique backgammon terms of Dance, Dilly Builder, Eject, Freeze a Builder and Mixed Roll for these skill games. Captain: refers to the team player who plays against the box in the game of chouette. Cash: term for making the offer of a double when a player is assured that his/her challenger will refuse the offer. Centered Cube: refers to the center bar position of the doubling cube before a player makes the offer of a double. Checker: also known as stones, men, counters or pieces; this term refers to each player's markers while playing the game and rolling the dice. 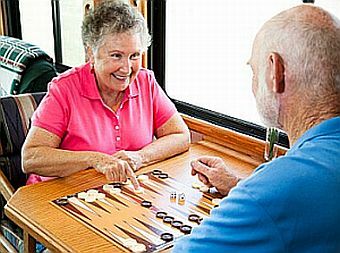 Chouette: backgammon games terms for version that involves at least 3 players where 1 backgammon player goes up against a playing group led by a captain. Clean Play: jargon for a legal move. Close Out: refers to making your board or to close out a challenger by closing all the points in your home board. Closed Board: when a player has made all the points on his inner board, his opponent will be unable to re-enter any checker he may have on the bar into the game until an open point becomes available again. Closed Point: jargon for point containing 2+ checkers. Cocked Dice: jargon for dice that do not lie flat when rolled and must be rolled again. Combination/Indirect Shot: occurs when 2 dice numbers are applied together to create a roll larger than 1 die. Example of 6+3= 9 pips for one checker. Come In: backgammon games glossary term for action of re-entering from the bar. Comeback Shot: jargon for a dice roll that allows a checker on the bar to hit a blot. Comfort Station: term for the mid-point. Communication: movement of positioning checkers within 6 pips of each another to create mutual support. Consolidate: term for grouping checkers, thereby reducing the number of blots. Contact Game: term for a scenario where 1 player may hit or block the challenger. Count: refers to number of remaining moves required to clear the board or pip count. Cover: to shield a blot with a second checker, ensuring it is made. Cramped: jargon for a player in a tight position of decreased movement. Crawford Rule: used only in match play, when a player reaches a score in which he is only one point away from winning the match, his opponent is not allowed to double in the next game. Crew: refers to team players and captain playing against a single player or box in a game of chouette. Crossover: backgammon games terms for movement of a piece. Example, from outer to home board. Crunch: jargon for player's position whereby a prime must be broken up as it is the only play available. Cube: backgammon term for the doubling cube. Cube Decision: it's decision time. Do you offer a double or refuse/accept? Cube Equity: term of reference to money wagered using the doubling cube. Cube Ownership: rules of the game determine that a player can double only when in possession of the cube and if it's their turn. Procedure is to make the offer before throwing and if accepted by an opponent, the cube is then placed on their side of the board. Current Stake: calculated as the original stake x value of the doubling cube. Dance: to have a checker on the bar, and to roll numbers that are blocked in your opponent's home board and do not allow you to re-enter. Dead Checker: term for a positioned piece well into player's home board thereby having no advantage. Dead Cube: occurs when the doubling cube offers no advantage. Dead Number: a useless roll that serves no advantage and thus is forfeited. Decline a Double: occurs when a double offer is declined and the game is surrendered. Deep: term for a piece located on a low-numbered point. Deep Anchor: a made point that is positioned on your opponent's 1 point, 2 point, or 3 point. See also, anchor and advanced anchor. Deuce Point: jargon for the 2-point. Dice: the tools of the game, these are cubes with pips or dots marked on six sides for the numbers 1 to 6. Dice Cup: another required tool, this is the round container used to roll the dice. Dilly Builder: term for a space piece/counter that is permitted to land only deep into a player's home board. Direct Shot: a blot or lone checker that can be hit with a roll of six or less. Diversification: where a player positions his/her counters across the board in a strategy move to produce an advantage roll. Divide and conquer. Double: action of offering a double to a challenger, thereby doubling the stakes. Double Ducks: jargon for a dice roll of double twos or 2-2. Double Elimination/Double Knockout: backgammon games terms for tournaments whereby a backgammon player is not eliminated unless he/she loses twice. Double Game: occurs when a player has not been in the position to bear off any counters resulting in a loss of the game and paying double his/her original stake. Doubler: another name for the doubling cube. 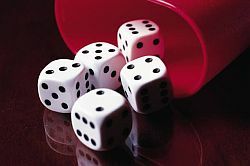 Doublet: jargon for a roll where the dice reveal the same number. Example 3-3 or 5-5. Doubling Cube: refers to the six-sided cube applied to monitor when the stakes are doubled in the game. Cube has the numbers 2, 4, 8, 16, 32, and 64 marked. Doubling on the Come: jargon for a double offering when a productive roll is anticipated. Draw: term describing the partnering of tournament players. Drop: to resign from a game when one's opponent doubles--to refuse the cube. Drop-take: occurs when certain team players decline a double offer while others take it and play. Edge of a Prime: term for open point positioned in front of a challenger's prime. Eject: movement to escape an ace-point game to stave off losing a gammon or a backgammon. End Game: term for the last stage of the backgammon game wherein a player starts to bear off and further contact comes to a stand still. Enter: action of moving a hit piece from the bar into the challenger's home board. Equity: the chances of winning the game. Escape: moving a runner past the challenger's blockade or to safety. Exposed Man: refers to an open piece or blot that could be the victim of a direct shot. Fan, Fail or Flunk: see Dance. Fast Board: occurs when a player's remaining pieces are on high points, he/she anticipates taking off at least two checkers on each dice roll. Field Goal: refers to the player's chance of hitting 2 pieces positioned 2 spaces apart by rolling a number that lands between them. Fly Shot: a checker that can be hit with a roll of seven or more. Also called indirect shot. Fold: backgammon games terms for not accepting/declining a double. Forced Play: you have only one legal move on this dice roll. Forward Anchor: refers to advanced anchor, generally positioned on the challenger's 4 or 5 point. Forward Game: refers to the stage of the game where further contact ceases as all player's pieces have passed each other. Free Drop: action enacted after the Crawford game and if the trailing player has an even number of points left. The leading player may choose to refuse a double, but not reduce the number of games his/her challenger requires to win. Freeze a Builder: strategic move to leave a piece within reach of a challenger thereby occupying a point with only two counters to prevent active builders. Front a Prime: action of making the point in front of a challenger's prime. Game Plan: term for winning strategy; 3 game plans are run, attack, and block. Gammon: occurs when the losing player fails to bear off any pieces in the end resulting in the winning player scoring 2X the stake. Gap: jargon for the empty section between made points. Gin Position: the best position of all in that you can't lose. Girls: jargon for 5-5 dice roll. Go Out: occurs when the required points to win are attained. Golden Point: the fifth point in from the beginning of one's own home board, also known as the five point. Heavy Point: refers to point with 3+ checkers on it, known as a stack. Hit Loose: to hit one of your opponent's blots and be unable to follow it up with another checker(s), thereby leaving your own exposed. Hit or Knock Off: occurs when a player lands on a point with only one of the challenger's pieces at which time the piece is put on the bar and requires re-entry before other pieces can be moved. Hit and Cover: a 2-step action that begins with a hit on a challenger's blot then moving on to cover your blot with the same counter. Hit and Pass/Pick and Pass: another 2-step action starting with a hit on a challenger's blot then moving to safety on your points. Hit and Split: backgammon games terms for yet another 2-step by forwarding a back man then hitting the challenger's blot somewhere else on the board in just one move. Holding Game: this is a strategy used by a player who is behind in the game with the intention of hindering the opponent’s ability to bring his checkers home safely by holding on to one or more points on their opponent's side of the board. Inner Board: the part of the board nearest to the end where you take your checkers off the board. This is the part of the board numbered 1-6, the inner table, infield or home board. Jacoby Rule: this rule states that if neither player has offered the doubling cube during the game, there cannot be a gammon or backgammon. Kill a Man: this checker has gone so far into a backgammon player's inner table that it might as well be forgotten. Kill a Number: strategic move that positions specific dice numbers unplayable for the next turn. Backgammon Games Terms is part 2 of 3 for the Backgammon Glossary. The thirty checkers in a game represent the number of days in a month of the Persian calendar and the twenty-four bases symbolized the twenty-four hours in each day.